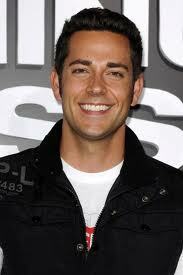 that’s interesting… I have never seen Zach Levi as anything other than Chuck although even nerdy he is kinda pretty hot. but stop distracting me from the real point, Darci!! 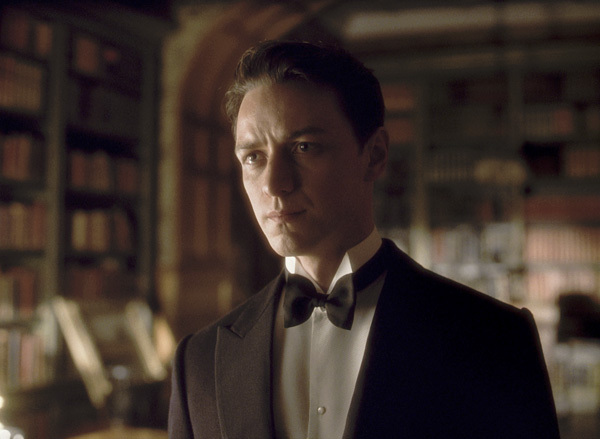 The REAL point is, as ALWAYS, our boyfriend, James McAvoy. Di, don’t forget that Anne Hathaway was all like, “At first I thought he was a pretty cool guy and fun to work with but then we started doing the scene and I was like, woah, excuse me, I’m working with a Future Legend!” Plus she said he was a really great kisser. Which we knew anyway. You can just tell. Those of us who REALLY love him know all. Though he would never admit to it, being the self-effacing guy he is. True perfection remains unheralded. Except by us. p.s. hee heeeee, Hugh Grant IS totally droopy. He’s like that bassett hound cartoon guy. Though he was once #1 on the list due to Chopinity and Mauricitude (Clive Durhamosity, that is). I fell for Pierce Brosnan as Phileas Fogg but his appeal wore off a bit in subsequent features. Overdone, I guess. I agree about Cage too. 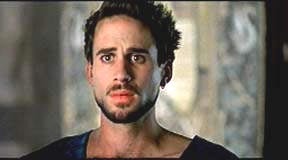 I have found him somewhat cute before but always in a Neanderthal mouth-breather kinda way. He did play Alessandro Nivola’s brother the one time, though, which gives him points in my book. And Jude Law definitely in Ripley. So very golden old-days, like he actually was (hollywood) royalty from the 30s or something. He’s never repeated that particular glow, though Napkinhead the widowed dad in Holiday was of course cute. You know that I’d trade Joseph for Ralph though. Older sibling thing, I guess. You know who else never did it for me? Michael Douglas. I just don’t get it. He’s a little gross. And the Sheens. Not gross, but just nothing there. And while I admit that Colin Firth has his moments for sure, and did play a fine Darcy (old and new), and that guy who learns the Portuguese in Love Actually… he doesn’t do much for me. …but I’m surprised you left out Johnny Depp! I thought he was like ubiquitously adored! If you had a list that included men who are NOT actors, who would be on it? (p.s. – my (actor) list would also include besides the aforementioned: Vincent Perez…Tony Leung…Patrick Dempsey… Jimmy Stewart…I’m on the fence about Nathan Fillion these days. Do I only get 5? The other contenders are a bit cliché – Paul Newman, Richard Gere, George Clooney, Liam Neeson. Probably Alan Rickman. Bruno Ganz. Matthew McConnaughey (good grief, where is she going with this?). John Cusack. Jeremy Northam (whatever happened to him?). Toby Stephens and his dad as a package deal. The Wilson brothers, ditto. Obviously have some narrowing down to do. Peter Gabriel is technically not so much an actor, so he can have his own list. Yo-Yo Ma would be on that one too. Jon Stewart is also verging on another list, but he is pretty cute, though more in a best-buddy kinda way, though maybe the best buddy that you end up falling in love with after they get engaged to someone else. Just like in that movie with Patrick Dempsey where Michelle Monaghan falls for Kevin McKidd, who incidentally is good list fodder even if purely for being Count Vronsky. And Scottish (Scots?) (Though he excels at American in Grey’s Anatomy). Anyone from Scotland automatically gets double points. Maybe triple. p.s to the p.s. In the Land of Laminated Lists, beautiful actors never die. And always remain preserved at the peak of their physical and societal charms, whenever that may be. The prospect of sharing sodas with 1946 Jimmy Stewart is about as likely as with 2010 Johnny Depp, so we’re not judging here. Paul Newman is still selling salad dressing, even if he is dead. The world is an amazing place. I have some more comments but I think I should leave them for another day. 5 is probably enough for right now. Yes ladies, you many call it your Laminated List (which I’ve never heard before now I am ashamed to say) but here in backwoods NB, we call it our “To Do List” 😉 And Zach tops it every time, with Sean Connery following a close 2nd! I like the pics you’ve put up. 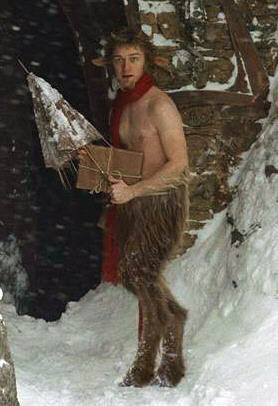 Ah, Ryan Gosling… he is totally on my list. Except he has the disturbing quality of resembling Matt Reeves. Ew. I try not to hold that against him. I don’t think I knew Ryan Reynolds was Canadian! Did he and Nathan Fillion know each other before 2 Guys and a Girl? I think you should link to the Handsome Men’s Club here. A propos. Jason Statham – his sweet accent totally makes up for his lack of hair. Edward Norton – no one can deliver dialogue like him. Daniel Craig – it might have been because the first movie we watched on our HDTV was a Bond movie and I couldn’t get over his crazy blue eyes. I like that he’s a bit older and looks a little roughed up. Totally agree with your Ryan Reynolds – just totally all around cute. I used to really dig Jude Law but the nanny affair really ruined it for me. But personality aside, yes, he’s still pretty yummy. And I totally agree with every single one of your non-list picks, especially Nicholas Cage. Does that guy’s voice ever change in pitch?